Matabeleland Select Football Team, a regional team from Zimbabwe, qualified for the CONIFA World Football Cup Finals to be staged in London in May/June 2018. Founded in 2013, CONIFA is the body that oversees non-FIFA affiliated football associations. Some of these nations are stateless nations while others are marginalised or politically persecuted nations. Still others are nations within nations bound by distinct cultural ties that set them apart from the rest of their fellow countrymen. Not surprisingly, Matabeleland Select Football Team fulfilled the stated criteria by virtue of originating from the Matabeleland region of Zimbabwe. Need I say more? The road to the Conifer World Cup has not been an easy one. This team qualified by sweeping aside a team from their neighbours, Zambia . Nicknamed Ingqugqungqulu, the boys in white and yellow mean business. They have had intensive training for over 9 months and have played some challenging highly competitive friendly matches. Recently they dispatched Bulawayo Chiefs 5-1 in a thrilling match. Then they again overpowered a spirited ZRP Gwanda 2-0 this month. They have more matches lined up including playing other local and regional giants. Watch the space,this team is going places literally. Matabeleland Select will not only fly Matabeleland's flag but will make the rest of Africa proud too. Ingqungqulu's first game is set to be played against Padania in a Group C clash on Thursday 31 May at 3pm at Gander Green Lane, home ground of Sutton United F.C. UK based fans are in for a treat. 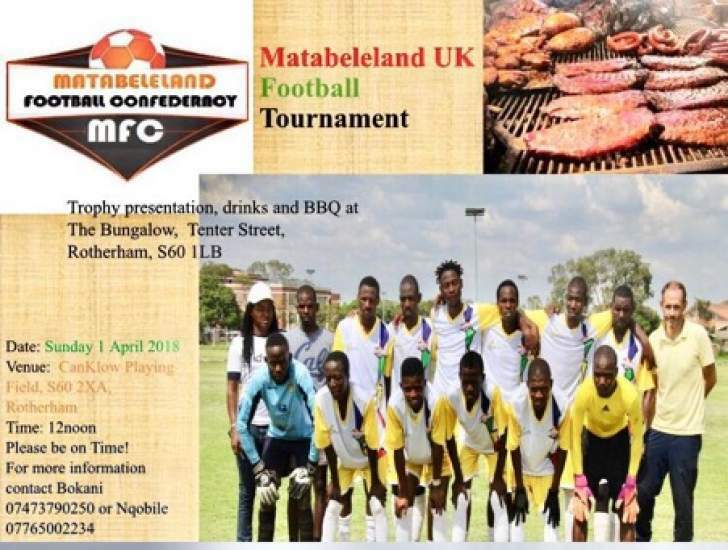 The UK based Matabeleland Select Football Team Support Group, is hosting a fundraising event to support the team. There is a huge financial outlay required in flying the team to the UK in addition to accommodation, transport and other costs. While CONIFA is meeting some of the costs, the team is facing some financial challenges, especially flight tickets. It is in this spirit that the support group has decided to hold fundraising activities during this coming Easter weekend in Rotherham. To kick of the activities, a 6-8 team football tournament will be played on Sunday, the first of April. The winners will walk away with a fitting trophy, football kit and possibly more. There will be other small prizes for runners up and outstanding individual or team performances. In the evening we will host a party at the Bungalow Social Club where we will enjoy music and African cuisine. Expect more than the usual Amawoso and umqombothi. Nanzo ke Izingqungqulu zikaMalandela, kasizeni ngobunengi Mhlabezulu sizozibonela ukudla kwamehlo.